New Videos Series online ** Upcoming Radio Interview ** Keeping it short! I have been working diligently this past few days and nights getting videos edited and uploaded onto my website and You Tube… these are processes you cannot rush so patience is most certainly a virtue! There are two new sets of videos. One on “Evolving Consciousness” – this is a series of 10 clips of under 10 minutes each. Then on my website there are the excerpts of a performance of Life Theatre…..not the whole dialogue…just enough to tantalize I hope! Did a kundalini class on Tuesday evening and it felt good to move the body again… I have been lazy! I’m keeping it short today…Enjoy the rest of your week! More facts from wine country ** On the road to where! ** New people and places ** Dance floors without practice mirrors! In my rush to get something online I missed a lot of the facts I learned during this journey. Please note I will give you what I remember in simple terms as my technical knowledge is not there yet. I had all this stuff roaming around my mind in the wee hours of other morning and as I want to keep the blog journal in sequence my journeys this past week will come after later. As I write this piece today I am listening to Andre Bocelli and am in heaven – I am back in Europe with the feel of the music touching a very deep, longing and loving place within me….the passion of life within the words and music is so powerful….is this not what we seek on this journey!!!! 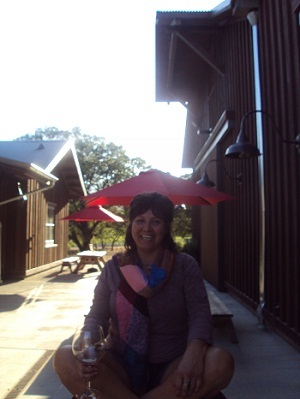 Such pondering within the Sonoma wine country! The vision of Lucy and Ethel stomping grapes in the vineyard is a fact of the past, yet anyone who saw that episode will smile at the memory and craziness it portrayed. This young man working the grapes by hand is as close as it gets today! 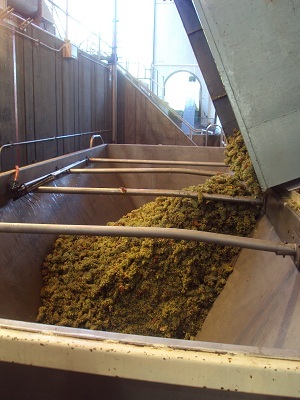 Grapes in general – the tannin comes from the skin- juice comes from the pulp. 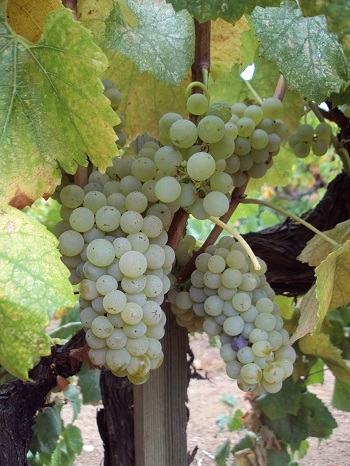 Within the field or blocks of any particular variety of grape, for instance, chardonnay, merlot, shiraz, etc. the flavor and characteristics change noticeably because of the amount of sun, soil makeup, moisture, drainage, and pruning. As I walked through the blocks randomly picking grapes to taste after a while I was able to tell where there were higher sugars, more or less acid, more pulp juice, lightness or depth within the variety. When all these different flavors come together in the pressing each batch becomes absolutely unique and pretty much can never be replicated. The weather and the slightest fluctuation in moisture at the wrong or right time can make or break an entire season of growth. 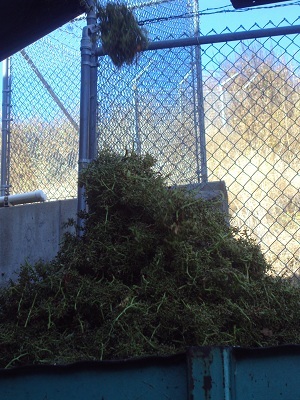 Too much or too little sugar or acid; water and heat create mold within clusters; to prune or not to prune allows for more or less light and sun or not enough at a crucial time. As with all agriculture, reading Mother Nature’s cycles is an art and discipline borne out of experience. In all fairness to life’s journey I do have to say that there has been a few moments of misunderstandings and assumptions by the three goddess’s in different situations on the journey to wine country. These are not to go into yet only to say that hindsight is such a great equalizer when objectively viewed from not only our 3-D world but also the unseen and higher realms of purpose. I thank my traveling companions for the gift of such great realizations into my own work and that of the greater picture we all so often (myself included) miss! After the time spent with the Pete Barra and family, I headed south to Sabastapol. My first visit turned out to be on a Sunday, day of the farmer’s market on the central plaza. It also turned out to be at the time of celebrating and honoring the Pomo Indian Tribe of Northern California. Dancers, singers and drummers of varying ages shared their history and cultural traditions under warm sunny skies to an appreciative crowd. It was in Sabastapol that I had my first “couch surfing” experience with Bob and Kat. 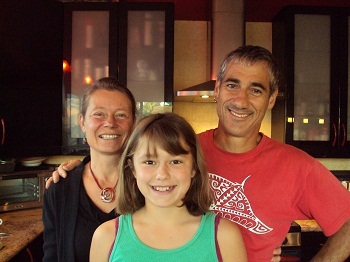 They opened their home and hospitality to me and what a great experience it was all around! Bob loves his “bike” and it turned out that he had just arrived back from a 30 day ride around Co, NV, AZ and CA. From there I went to Petaluma for two nights and “couch surfed” with another wonderful family, Ron, Imka, Kayla and Sabastian. Conversations around the dinner table, watching Ron successful can the abundance of tomatoes they had grown in their garden and being charmed by 11 year old Kayla and her talent with the cello, clarinet and piano and wonderful her innocent dialogue. 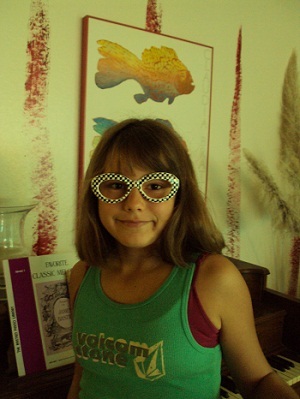 Kayla in her “shades”! I am now just outside Sabastapol in Forestville staying with another woman. 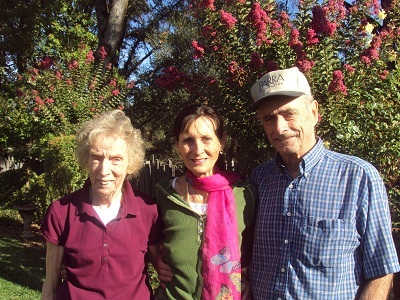 Irene is a former dancer and lives in a small home with an amazing garden she has cultivated over the past 10 years. She grows everything and has six chickens to boot! She asked me to stay here until next Wednesday to look after her garden while she takes a few days off for vacation. After that, I’m on to another adventure over the weekend with Therese! I have been paying attention to the “clues” popping up as to whether this (Sabastapol) would be a good place to live! I thought Shasta area may have been it, but it appears not to be! The theater, dance and creative scene in Sabastapol is very strong as is the healing arts community. A partnership would be a nice plus as well….time will tell! Today we woke up to a soft rain and my host Irene went into panic to complete all the things she had not done to prepare for the first rains. What made it more urgent was the fact she was going away for a few days and could only see disaster “things” were not done. I helped where possible with picking tomatoes and grapes in the morning rain but left her to plants seeds and attend to her stuff while holding a quiet space…it is interesting how I am understanding the meaning of this type of presence! Last night I went to a small theater production featuring 2 actors and puppets offering a dramatic message of life situations.. Independent Eye Theater! It was a different format for messages similar to my Life Theatre production! About noon I left to go and do my washing, get coffee, visit the farmer’s market and then joined the last day of the countywide Art Walk by driving around following the signs to various galleries….millinery by Amy Smith- flyingcolorstudios.com (what I thought was a lost art – hats, both panama and felt, were part of my school uniform in Sydney), woodworking, photography, weaving, painting and incredible junk art by Patrick Amiot (patriclamiot.com). His art is featured all over the town in parks, commercial buildings and people’s front yards. The whimsical memories of childhood are caught in each piece! Well, I think I have pretty much covered it for this installment….I hope you days and nights are unfolding in similar mystical fashions. In conversations and observations with others the common theme (although unaware by most) is about life and passion for it….finding it….settling for less to keep peace…where to find balance in and to be in love with?……where are you in the dance….can we find each other on the same dance floor…..or will it be a brand new, scary, unknown, unproven, illogical location without a practice mirror to reflect US back to OURSELF!!!!!!!! OUCH! Last Wednesday seems so long ago although it is only a week that has passed. That morning I left Jessica’s home after spending a few days “keeping Girl company”. Girl is Bill’s dog and he and Jessica were still away in Colorado. I traveled south on Hwy 5 to Hwy 20 and then Hwy 101 with the final destination of Ukiah in sight. There I was to meet up with Therese and Pamela to spend a few days learning and “helping” harvest grapes for Pamela’s latest wine creation. That night, after several false starts we met up at Sophia’s Italian Restaurant to meet Pete and B Barra, a very special couple. 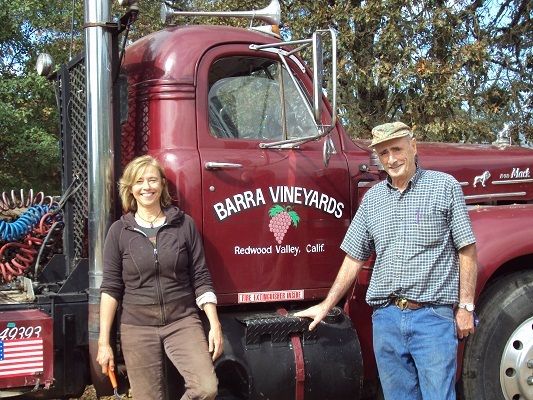 Pete’s family, along with the Fetzer and Parducci families are perhaps the oldest and most established organic wine growers and producers in California, if not the country. Pete’s father came over from Italy as a young man, eighty + years ago and began growing grapes. 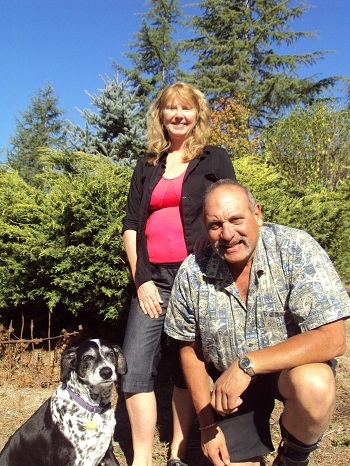 The family has lived in the Redwood Valley area all these years. My knowledge of the wine growing and harvesting industry was minimal at best yet I could always tell a good and a really good bottle of wine (although both were not always in my budget). On Thursday morning just as the sun was coming up, two (2) crews of ten workers each arrived to start picking. 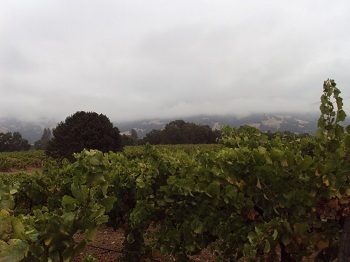 In the morning due to the cool damp air, a mist hung over the valley and vineyard and as the sun rose and warmed up the moisture was cleared by the warm sun. Such a beautiful, mystical sight! At lightening speed these men would go down row after row of vines, cutting the grape bunches, filling up tubs and buckets and then running to the main bin, dumping and starting again. In the morning air you could hear conversations and songs in Spanish and laughter would ring out from time to time. It would seem that games were played to see who would be the fastest picker. After trying our hand at cutting bunches, Therese and I helped pick out the leaves and debris from the grapes dumped in the bins. This we realized later is an important step that is often left out by larger commercial operations. What was interesting to me was that as this went on I would often have “songs” reveal themselves. The songs, as with many of the songs I am given, were in strange and ancient languages. It was like tapping into the ancient memory within the grapes. This all made sense when I learned about the yeast! The grapes being picked were for Chardonnay wine. Each main bin holds approx. 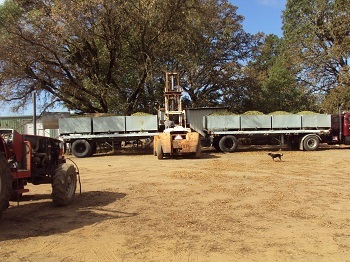 three (3) tons of grapes. 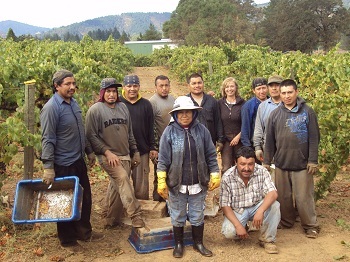 Over the two days of harvest, this consisted of five hours each day, a total of sixteen (16) bins were filled with a final count of forty two tons (42 tons) of grapes picked. 6000 + gallons = 2500 + cases = 30,000 + bottles = an awful lot of glasses of Chardonnay! 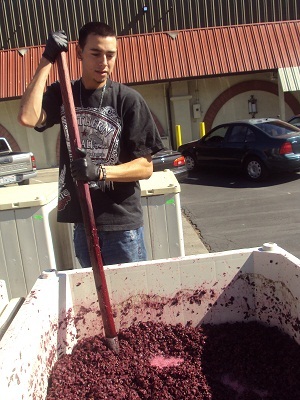 After picking the bins were taken to Parducci Wines for processing. First having the stems removed and then put through the huge crushing tank to extract the juice. This was then fast frozen to stop bacteria forming, then several days to a month later the juice would be heated to about 60 degrees and the yeast added. Pamela said she would use yeast from a South African strain that carried many of the characteristics she desired the final wine to reflect. Apparently there are only about 200 strains of yeast that are used worldwide, and each strain can be traced back to the very original yeast seed, hundreds if not thousands of years back. Pretty much, this means that all wines, no matter the type and origin could be related. I also learned that the older the vine the deeper the roots grow into the earth and the farther the vines reach out to other another. This again shows the amazing intertwining of types and heritages. Could this be why wine and the grapevine have been exampled in stories from the bible and other ancient teachings and mythology! 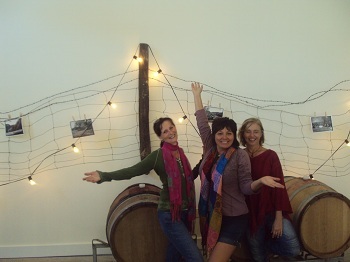 During our time in Ukiah, the three goddesses took a tasting trip to the Anderson Valley. What beautiful countryside, amazing vineyards and some very special wines were tasted. On Friday night, Pamela and VinFuzion very kindly treated Pete, B, their daughter Cindy and son-in-law Michael, Therese and I to a wonderful dinner. On Saturday morning the three of us left to spend a few hours at Harbin Springs before going our separate ways over the next days. In will leave the next part of the journey for next time! Perhaps you can enjoy a glass of vino this evening! I’m working on the next message! So much has happened recently and I am still floating and not necessarily in a completely good way….meeting new people from different walks of life…still looking for the place to “hang my hat”. I miss the mountain energy and most especially the water. Pictures and stories to follow soon. My phone has been doing strange things recently…people are getting busy signals and I have no idea why. Last few days seem OK! Please keep trying as I would love to talk an catch up. Things they are a changing! ** Fall to Water Rose and Earth…. ** Coming Full Spiral! What on earth is she talking about this time you may ask while reading the byline….well it is all of these things and more. What an intense couple of weeks, not to mention this last week. I finished the month of September (9 for completion) with endings of many sorts…actually not so much endings as realizations on many levels but the minor details are not important right now. What I will say is of course, the common denominator is me and how I act/react to the scenarios presented. As my last house sitting experience was coming to an end I put out the request to the universe ” I would like the perfect place to live and create to come to me, all past requests are still in tack and this time I am asking to include “walls and a roof”….I failed to put that clearly into the last request and ended up camping on Mt Shasta and at Castle Lake for 7 weeks….which is fine in the summer but the first frosts have come this direction and that won’t do now! That being said a place did present itself to me through a friend. It seemed perfect. Small, on my own, convenient, affordable- a great place to call a base. Seemed good for the next week or so and then last Friday I met with the landlord and the message was very clear to me…this is not where you are to be! I left there feeling disappointed and accepting. Just to confirm that I got the message, about fifteen minutes later another scene played out in the local health food store which in essence was showing me to move out. (I won’t go into details for privacy reasons) Then to make sure that I really did get the message not fifteen minutes or so later a truck comes barreling along the outside lane as I turned a corner…just the velocity sent the feeling of being pushed out of the way. Of course the driver meant me no harm but it was the spirit energy that was to get my attention, and it did! OK, I get it, I’m to leave Mt Shasta yet on good terms in all ways with all relationships. That being said I will now go back to the previous Wednesday when having lunch with a “new friend” another REALLY POWERFUL message was given. I met this woman during my ayahuasca journey in the summer. She was one of the facilitators and I liked her right off. I also found out she had produced her own “one woman show” in the late 90’s and she shared her experiences with me. The other part I had not put together was that now she also led relationship classes, so as you can see “spirit had certainly stacked the deck to make sure I got the message, whatever that may be! Our polite, fun, admiring and creative dialogue somehow shifted and I felt my issues coming up when she talked about her powerful and wonderful personal relationship…she picked up on me and then sitting back as though not wanting to be in my space said “wow, you are one pissed off woman!” To which my response was “you are right!” It didn’t matter what I said in defense, response or explanation…it was coming out wrong and made me look even worst..at least in my eyes. She couldn’t wait to get out of there! 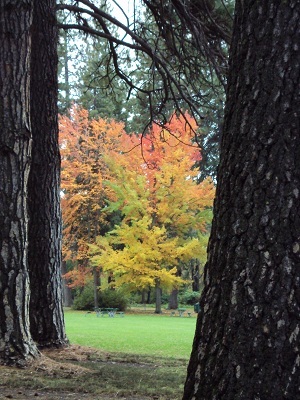 I went to my car, then decided to get a cup of coffee and a brownie (chocolate always helps) and go to Lithia Park. Arriving at the park to my surprise was a small group of people doing contact improv dance…..wow! I watch for a while and then ask about where they do it on a regular basis. Before actually hitting the park I went by the Shakespeare booking office only to find out that at that exact moment “Hamlet” was being performed in the theater right on the park border…..so what you ask! Leaning against a tree, note book in hand and watching the dancers I feel the need to write. It starts out slow and stilted and then the words being to flow as though I am having a conversation with the writer in another dimension…..the title written on the page was “Acknowledge the Locked and Blocked Heart of the Past”. I will leave out parts for other’s privacy…yet as I was to realize so fast the true depth of this whole situation stretched back in time to the late 1700s and even further back than that, through the lineage of pained women in my birth family. “I have betrayed myself as not worthy, unlovable and put up so many barriers to love I can’t even see a glimpse of the innocent one who came into this world. Oh to be a vulnerable vessel so filled with space no degree of love and blessings can be turned away. 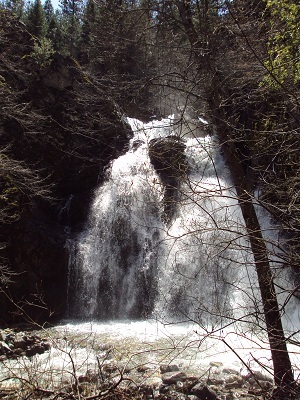 Space so filled with high light and life and love that joy abounds as the overflowing waters of rivers and streams burst forth their banks with life force blessed. Your beauty soft and gentle, soul touches you with the breath and whispers..transcend the pain to radiance pure…the touch you long for and is there..it is you awaiting in the shadow…always has been awaiting in the shadow..
Light force pure and blessing within, fear not the rejections, do not see as such to prove at times are just a miss of truth – words not spoken for fear to know the loss and charge.. It was on contemplation of these words along with the changes in some of the script for Act 1 in my Life Theatre performance of Two Suitcases, have I grasped the full meaning of the relationship, how it played out over the course of my stay in Mt Shasta, of the intimate and emotional baggage I have carried from both my parents and most significantly, the corresponding chapters of Soul Essence Memory I have carried and now wish to release and clear. For many years in my work as an Intuitive, Energy and Vibration Practitioner and other titles given, I have known and tried to explain (both successfully and not) that one’s Soul Essence Memory is a/the driving force of life, and now it is only through my own personal life journeys am I getting validation of such….and I know there is so much more the higher Divine realms are wishing to shared with us….but not before we understand the baby steps of the new times. There is so much more I could share right now, however, I need to do more processing before doing so. Where am I heading next….to the vineyards to harvest grapes, bring the Goddess energy of distance times past when Pamela, the vintner, Therese and I once shared ritual of harvesting the elixir of the Gods and the Mother….the rest is unknown yet now I stay open to love, life, beauty, creativity, joy and rebirth! Coming full spiral verses coming full circle……the spiral never repeats itself, keeps flowing, evolving in possibilities up or down. Whereas the circle would keep repeating itself over and over again…..I choose the former…..what is your choice? As we all wait in anticipation…….. The first photo you see was during “my blond” years in the early 90s. 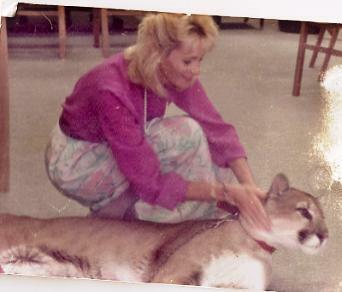 Taken with Zodiac, a Florida Panther. For some unknown as yet reason, he wishes to be seen tonight in this message.